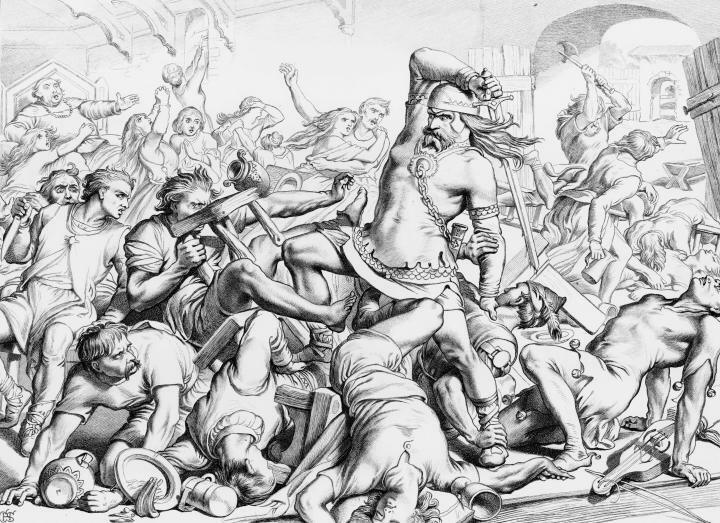 A 19th century interpretation of Hereward in battle. Click through for citation. Hereward the Wake (which was understood as the Watchful) was an English folk hero that served as early inspiration for the Robin Hood legend. Pretty good records exist verifying his existence, but some stories connected with him seem obviously exaggerated. In the 11th century, natives of northern France known as Normans and led by William the Conqueror were trying to conquer Britain. Already occupying Britain were the Anglo-Saxons, who were Germanic. Evidence of both these heritages can be seen in the modern English language, which blends Germanic grammar with French vocabulary and sprinklings of Latin. Hereward was from South Lincolnshire which, due to its location in northern England, was one of the later areas to feel the grip of the Norman rule. He is purported to have been a very wild young man, with eyes of two different colors, who constantly got into arguments with his father. Hereward is renowned for his stand against William the Conqueror. A group of Danes (also known as Vikings) picked him up, sacked the abbey at Peterborough, and then escaped to the Ilse of Ely. Here we can see parallels to Robin Hood and his Merry Men. Eventually, William the Conqueror won, but not before Hereward had made quite a name for himself as the epitome of Anglo-Saxon chivalry. Previous How do cough suppressants work? Next Give Hamlet another chance!